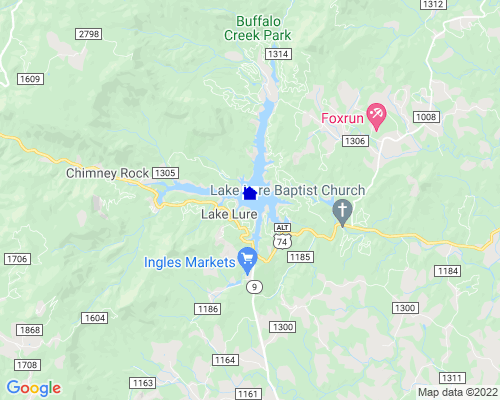 Lake Lure is located just 26 miles southeast of Asheville, NC on Highway 64/74A and about 17 miles east of Hendersonville, NC. Lake Lure is located in the scenic Blue Ridge Mountains of Western North Carolina. Along with the small towns of Chimney Rock, Bat Cave and Gerton, Lake Lure is part of Hickory Nut Gorge, a 14-mile valley with spectacular scenery and great opportunities for relaxation and fun. Along the floor of the Gorge flows the rushing Rocky Broad River that empties its crystal water into Lake Lure at the eastern end of the Gorge. Pristine water quality and numerous wide coves that provide safe areas for swimming. Lakeside restaurants so you can motor your boat up to their dock for lunch & dinner. Depth of Lake: 110 ft.
You must have the appropriate North Carolina fishing license to fish in Lake Lure. You can obtain your license locally at Riley's Hardware, located just across the highway from the Lake Lure Marina. Riley's also carries fishing supplies, bait and beverages. A permit specific for Lake Lure is required for boating on the lake. The year is divided into peak season (Memorial Weekend through Labor Day) and non-peak season. Boaters are considered either a resident of Lake Lure or a non-resident. Pontoon boats can be up to 28 feet long. Other water craft can be 20 feet 11 inches long. The size of the motor is not taken into consideration. Personal motorized watercraft (jet skis) are not allowed on the lake, as are houseboats or other boats with built-in kitchen and toilet facilities. Water skiing, tubing and other water sports are allowed. No more than two persons may be towed behind one boat. All persons involved in water sports shall wear proper U.S. Coast Guard approved life vest gear. Owners of timeshares in the resort end of the lake can purchase a permit for $75. The permit is valid only during the week of the timeshare. Proof of timeshare contract will be required. Non-resident permits are available at the Lake Lure Marina and from the Town of Lake Lure Municipal Center (open regular business hours, Monday through Friday). Proof of boat registration is required (out of state registration is permitted). The Lake Lure Marina is open on Fridays, Saturdays and Sundays in March from 11:00 am until 4:00 pm. The Marina is open daily April through early December from 9:00 am through twilight. r> Residents of Lake Lure must purchase their permit from the Town of Lake Lure Municipal Center. If purchasing a permit on Saturday or Sunday (when the Municipal Center is closed), residents may purchase a daily pass from the Marina, then apply the amount paid toward their annual permit when they purchase it at the Municipal Center. Boat launching is free and is available at the Lake Lure Marina, the Resort Marina and the Dam Marina. Boat slips are in very short supply on the lake. Owners of timeshares in the resort end of the lake can reserve a boat slip at the Resort Marina for $20 per day. Please call toll free (877) FUN-4-ALL to reserve your spot. Experience first hand the unique beauty of Lake Lure from the comfort of a luxurious seat aboard one of our spacious covered tour boats. Lake Lure Tours will take you past locations for the blockbuster film, "Dirty Dancing," and past acres and acres of unsurpassed natural beauty, wildlife and legend. Since 1994, Lake Lure Tours has been privileged to host over 250,000 passengers, making them the second largest tourist attraction in Rutherford County, NC. They offer a variety of cruises so you can choose the trip that is right for you. Call toll free (877) FUN-4-ALL for reservations. Famous for its beauty, crafts, culture, movie location settings, healthy atmosphere, and wealth of outdoor activities, Hickory Nut Gorge has traditionally been a favorite vacation destination for over 100 years. Chimney Rock Park and the Biltmore Estate are nearby and Lake Lure is conveniently located near many top mountain area attractions.